A simple farmer of Hergershausen (Hessen), who was the first person in Germany to attempt, at the beginning of the eighteenth century, to bring about the use of the vernacular in lieu of the Hebrew in the daily prayers. His "Liebliche Tefilah, oder Greftige Artznei vor Guf un Neshamah" (A Lovely Prayer, or a Tonic for Body and Soul), Frankfort-on-the-Main, 1709, though not the first Judæo-German adaptation of the prayer-book, was original in that it sought to give a literary form to the vernacular version, by amplifying considerably the original text of the prayers. The object of the writer is clearly expressed in the introduction to the book, namely, to bring about the substitution of this Judæo-German version for the Hebrew text in those spheres in which the "Holy Language" was no longer understood. 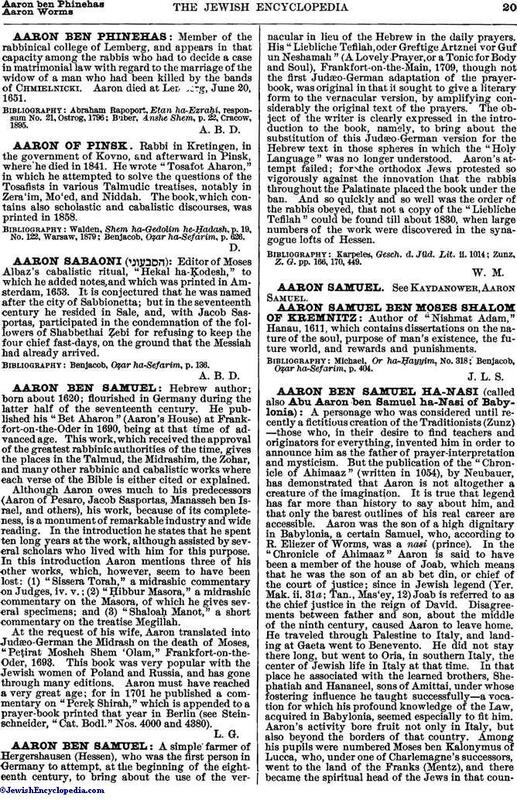 Aaron's attempt failed; for the orthodox Jews protested so vigorously against the innovation that the rabbis throughout the Palatinate placed the book under the ban. And so quickly and so well was the order of the rabbis obeyed, that not a copy of the "Liebliche Tefilah" could be found till about 1830, when large numbers of the work were discovered in the synagogue lofts of Hessen. Zunz, Z. G. pp. 166, 170, 449.